Make your shave ice exactly how you like it. First, choose from a dozen all-natural homemade syrups. 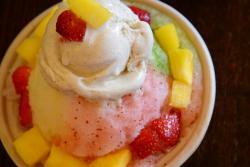 Then, top your shave ice off w/ any yummy toppings you desire! Or to save time & take out the tough decisions, just order one of our special creations! At hopa, we aim to keep our menu simple, yet fresh & exciting, & always ono & all-natural! Stay on top of hopa’s flavors by visiting this page. We’re constantly developing new culinarily-creative syrups & ono toppings – you very well might find a new favorite! It’s not just any ol’ shave ice, & it’s far from a snow cone. 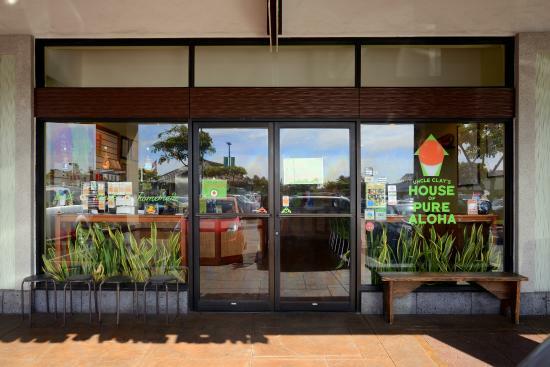 It’s hopa shave ice--all natural, homemade, local--a taste of pure aloha in a bowl. 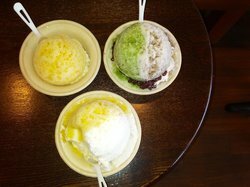 At uncle clay’s house of pure aloha we specialize in crafting hawaii’s most iconic snack—shave ice—to culinary perfection. Our original syrups are homemade w/ quality all-natural ingredients like fresh hawaiian fruits, flavorful all-fruit purees, & natural cane sugar. At hopa, we’ve made a vow to being real: no artificial flavors, no artificial sweeteners, no artificial colors, no artificial anything! As much as possible, we source our ingredients fresh from hawaii farmers & growers – doesn’t get more local & ono than that! For both young & old, hands-down the most popular flavor. Our homemade strawberry syrup is made from fresh strawberries (see the seeds?!). Pretend like you're strolling through an aromatic strawberry field & take a big juicy bite! Strawberries are a good source of folate & potassium, & a very good source of dietary fiber, vitamin c & manganese. A local‏ tropical fruit favorite! Our syrup is made from fresh ripened pineapples grown in hawaii soils. Hawaii is currently the largest grower of pineapples in the united states. Large scale growing began in the islands in the early 1900s & represented a very significant part of hawaii's agriculture industry. Pineapple is a good source of dietary fiber, thiamin, vitamin b6 & copper, & a very good source of vitamin c & manganese. Give your taste buds a ride: sweet, salty, & sour all-in-one. Li hing mui, meaning "traveling plum", is dried salted plum. 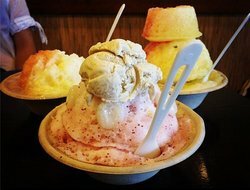 Li hing originally migrated from china, & it has since made a very comfortable stay as one of hawaii's most distinctive & beloved flavors & snacks. 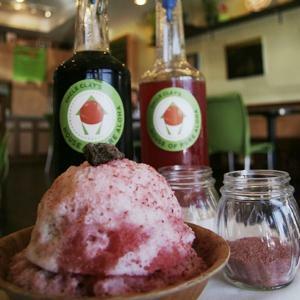 Our li hing syrup is homemade using all-natural plum flavor, hawaiian sea salt, & natural cane sugar. Bite in! Tastes like a fresh sunset-colored mango from the tree. Our syrup is homemade from all-fruit puree or fresh mango when local season is on. Mango is a good source of dietary fiber & vitamin b6, & a very good source of vitamin a & vitamin c.
Chocolate lovers meet hopa milk chocolate syrup. Made from scrumptious blocks of local milk chocolate from waialua estate, local milk, & natural cane sugar, it's a cool chocolate delight. Taste the creamy, rich, sweetness of this local flavor favorite. Our syrup is homemade from pure coconut milk & sweetened w/ natural cane sugar. Enjoy the cool essence & flavor of this distinctive & beloved fruit. Our syrup is homemade from all-natural pure lychee puree & sweetened w/ cane sugar. 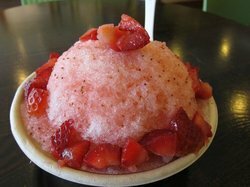 Poured on top of white shave ice, it's hardly noticeable, but take a bite & be prepared for a big flavor rush! Lychee is a good source of copper, & a very good source of vitamin c.
A first-of-its-kind vegetable shave ice syrup! Homemade from fresh kale & spinach from otsuji farm, sweetened w/ apple juice & natural cane sugar, & a squeeze of lemon. Rich w/ vitamins & antioxidants, don't worry if you end up going into a tailspin w/ kalespin, a favorite flavor for many hopa guests! After a savory explosion in your mouth what can you say? Take a walk on the ‘Wild Side’ and order something exotic. 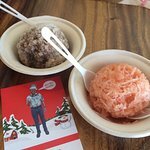 My Coconut Shave Ice w/Haupia Sauce looked like mashed potatoes; but, it wasn’t :)! A shop filled with love and family. Amazing flavor and mochi combos. Fresh fruit, fresh flavors. Highly recommend. Best place to experience local sweet local flavors. I love that everything is all natural and locally sourced. 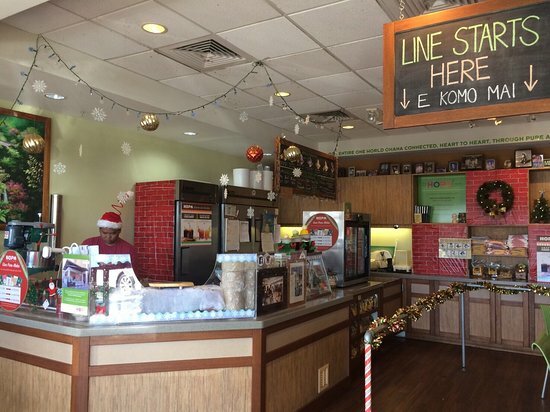 Supporting local businesses is what makes Hawaii the best place to live. We can never eat enough of Uncle Clay's. I take my daughter every week and she never tires of it. It's reasonably priced, refreshing, and not too sweet. The workers are always friendly and welcoming! 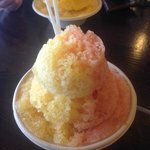 Imho...this is the best shaved ice on the island! 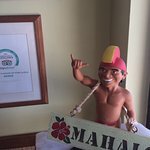 Get quick answers from Uncle Clay's House of Pure Aloha staff and past visitors.